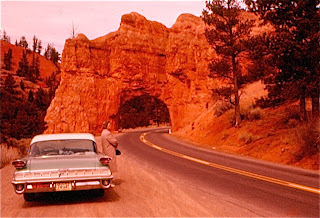 In the Spring of 1963 the late Fred and Mabel Port got in their Oldsmobile and drove 5700 miles around the country. We have pictures that document this trip. 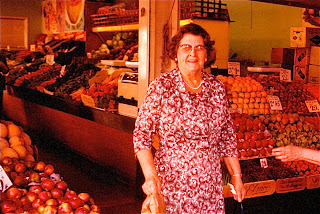 They were Farmer Fred's beloved grandparents. 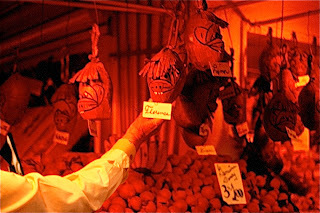 One of their stops was the Los Angeles Farmers Market. Fred Port was a retired rancher from Sioux County North Dakota and farm products were of interest. 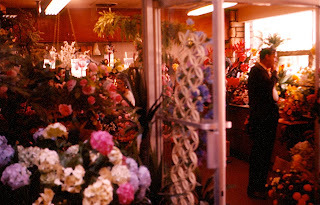 Mabel raised flowers and the displays of the LA Farmers Market were impressive. 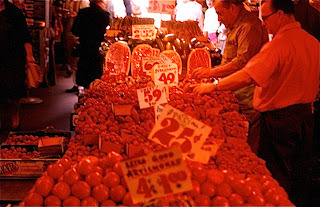 The availability of fresh fruits and vegetables was limited in North Dakota in 1963, and this market had to be amazing to them. 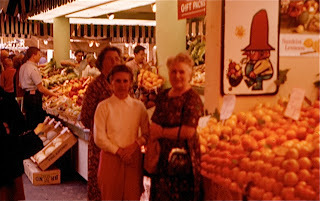 The Los Angeles Farmers Market opened in 1934 at Third and Fairfax. 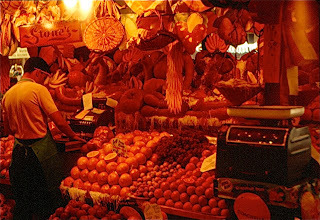 Billed as "the original" farmers market, it is still open every day. It appears that some items were priced by the piece and some were weighed on the scale before being rung up by the cashier. Someone has attached name tags to some of the carvings in this photo. 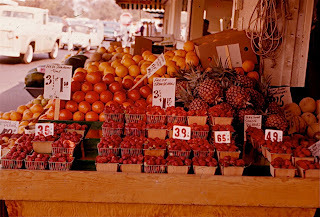 I hope you enjoyed this 1963 trip to sunny California's LA Farmers Market courtesy of the archives in GriggsDakota. That is pretty awesome...it's hard to believe fruits and veggies would have ever been hard to come by...especially in farm country?